“When my son Harvey was born in October 2007; I had absolutely no idea that things could be so drastically different from what you read in the books and magazines, during your pregnancy. He was my first child and I thought I would have a quick delivery and be off home with my perfectly healthy baby boy, to begin the wonderful journey of parenthood. Unfortunately this wasn’t what happened. We had one night together before we had any clue that something was wrong. The day after Harvey was born, I noticed his breathing was laboured and shallow, he was then whisked off to the Special Care Baby Unit, at Nobles Hospital. The doctors told us it was just an infection, and after having 7 days of IV antibiotics he would be fine and we would be able to take him home. I noticed his movements were jerky, but none of the professionals seemed concerned so I pushed it to the back of my mind. After a week in hospital we finally got to take him home, being reassured that everything was fine. Once home, I noticed he was jerking more, both awake and asleep, and when I mentioned it to the midwife who came out to see us, she assured me it was his nervous system kicking in and not to worry. Again I tried to not think about it and just focus on enjoying my new baby. The next day whilst being fed, Harvey went floppy, his eyes rolled into the back of his head and he started jerking violently; I knew straight away that he was having a seizure. We rushed him to hospital where he was admitted and lots of tests were done. An MRI scan showed he had benign tumours on his brain. He was diagnosed with tuberous sclerosis complex and epilepsy. What followed was a long process of doctors trying to control Harvey’s seizures. No matter what drugs and dosages they tried, his little body continued to be ripped apart by devastating seizures. The doctors had been consulting with neurologists at Alder Hey Children’s Hospital, and the decision was made to put Harvey onto life support and fly him over to the intensive care unit. We stayed in Alder Hey for a few weeks, eventually gaining some control and we were able to fly home with a bag full of medication and instructions on what to do if he had a seizure again. We managed to keep Harvey’s seizures under control for almost 4 months when he started with a new terrifying type of seizure; his body would double over, his legs would pull up to his chest and he would scream, this happened in clusters of around 20 of these spasms. At 5 months old he was diagnosed with West Syndrome. A severe and devastating form of childhood epilepsy. One of the charecteristics of West Syndrome is that they effectively lose their sight and hearing, the brain is so muddled with an irregular brain wave that it doesn’t function properly. You could have dropped a grand piano behind him and he wouldn’t flinch. Harvey spent hours sitting in his bouncy chair staring into space. He lost his ability to smile and react to any stimulation. It was heart breaking. After gaining some control with different medication, Harvey finally started to develop again and had to re learn all the skills he had lost. We then received another blow as it was discovered he had 3 tumours in his heart, which were causing him to have an irregular heartbeat. This could trigger an arrhythmia attack which could be dangerous for him so we learnt how to deal with that if it happened. Harvey started receiving respite from Rebecca House Children’s Hospice, and we started attending a mums and tots class at the special needs preschool when he was 1; meeting other parents with children with disabilities. We were told he may never walk or talk and we fully expected him to not be able to do a lot of things, so when he began to sit up unaided after his first birthday there were tears of joy! With good physiotherapy he even managed to crawl! I began to hope that one day Harvey may start to walk and as an adult be able to live independently. We had a few hospital admissions for various illnesses and a decline in his ability to eat solid foods, so he was given a nasogastric tube for feeding and medication when he couldn’t manage to do it orally himself. This was eventually replaced with a permanent gastrostomy feeding tube directly into his stomach. Due to his regular admissions to hospital Harvey’s veins had become hard to access and he was fitted with a porta catch in his chest so we had easy access to bloods and IV medication. In December 2010 he contracted swine flu and was flown to the intensive care unit in Manchester Children’s Hospital, where he was placed on the highest form of ventilation and we were told it was touch and go. With him being so susceptible to illnesses, there was every chance he may not make it. By some miracle he pulled through but that was the start of even more hospital stays as his lungs had been damaged from the pressure and length of time on the ventilator. Harvey started requiring regular suction and stopped being able to take anything orally, relying on his feeding tube for nourishment and medication. What followed was months of being in and out of hospital constantly, spending more time in than out. Steadily Harvey lost the ability to do the things he had worked so hard to achieve, eventually needing a dynamic wheelchair, hoist, bathing seat and 24 hour care. 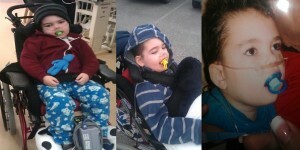 His seizures were out of control and he became oxygen dependent. Every stay in hospital brought more bad news and the stays on intensive care became more frequent. We were told his West Syndrome had progressed to Lennox Gastaut Syndrome and he received a few other diagnosis as well. I think this was the point where I realized we weren’t going to have Harvey for long. We were asked to make a care plan for life threatening emergencies, and an end of life care plan for when the time came. When, not if. It was devastating, but for me it was just something we had to do, the reality of why we were doing it didn’t sink in. In April 2012 Harvey contracted a stomach bug and couldn’t keep his medications or feed down. After a while in hospital, at the beginning of May, his stomach had shut down and I sat with his doctors and made the heart breaking decision to switch from treatment, which had become painful; and onto palliative care. He had no fight left in him. I always said that I would know when he had had enough and I would make the decision based on what Harvey was having to face and not my need to have him here; and that day I just knew he had had enough. We moved over to Rebecca House from the Children’s Ward and we spent the next 5 days making memories. Feeding the ducks, visiting the beach, having a picnic and we had him baptized. We all held out hope that his stomach would start working again but unfortunately that never happened, and on the 7th may 2012 Harvey passed away in bed with me, looking into my eyes. He was 4 years old.